This guide continues ABB’s technical guide series, describing the practical solutions available in reducing stored energy and transferring stored energy back into electrical energy. 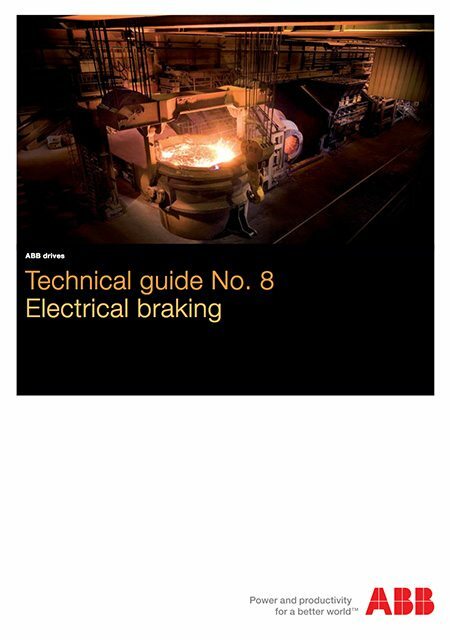 The purpose of this guide is to give practical guidelines for different braking solutions. Drive applications can be divided into three main categories according to speed and torque. The most common AC drive application is a single quadrant application where speed and torque always have the same direction, i.e. the power flow (which is speed multiplied by torque) is from inverter to process. These applications are typically pump and fan applications having quadratic behaviour of load torque and thus often called variable torque applications. Some single quadrant applications such as extruders or conveyors are constant torque applications, i.e. the load torque does not inherently change when speed changes. The second category is two-quadrant applications where the direction of rotation remains unchanged but the direction of torque can change, i.e. the power flow may be from drive to motor or vice versa. The single quadrant drive may turn out to be two quadrants for example if a fan is decelerated faster than mechanical losses could naturally achieve. In many industries also the requirement for emergency stopping of machinery may require two-quadrant operation although the process itself is single quadrant type. The third category is fully four-quadrant applications where the direction of speed and torque can freely change. These applications are typically elevators, winches and cranes, but many machinery processes such as cutting, bending, weaving, and engine test benches may require repetitive speed and torque change. One can also mention single quadrant processes where the power flow is mainly from machinery to inverter such as in a winder or an uphill to downhill conveyor. It is commonly understood that from the energy saving point of view the AC motor combined with inverter is superior to mechanical control methods such as throttling. However, less attention is paid to the fact that many processes may inherently include power flow from process to drive, but how this braking energy could be utilised in the most economical way has not been considered. The evaluation of braking need starts from the mechanics. Typically, the requirement is to brake the mechanical system within a specified time, or there are subcycles in the process where the motor operates on the generator side at constant or slightly varying speed. 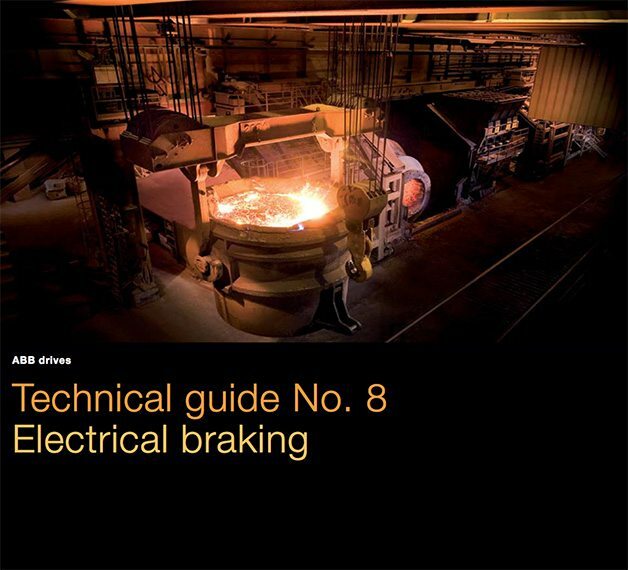 It is important to note that devices used in electrical braking are dimensioned according to braking power. The mechanical braking power depends on braking torque and speed. The higher the speed the higher the power. This power is then transferred at a certain specified voltage and current. The higher the voltage the less current is needed for the same power, formula (2.2). The current is the primary component defining the cost in low voltage AC drives.